ADDISON W. PRESTON. 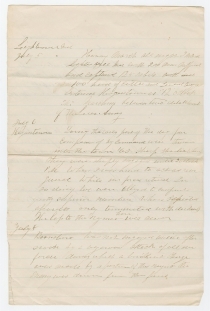 Autograph Document, c. July to October 1863, 2 pp., 8 x 12¼ in. While Col. Edward B. Sawyer was absent on medical leave, Lt. Col. Addison W. Preston led the Vermont cavalrymen through the Battle of Gettysburg. After battling Confederate General J.E.B. Stuart’s cavalry at Hanover, Pennsylvania, on June 30, the 1st Vermont Cavalry joined the Union line on the extreme left near the Round Tops. Throughout July 3, they joined a dismounted attack on the Confederate right flank, and a mounted assault late in the afternoon pushed back the Confederates but left 67 of their regiment - 10 percent of the 675 engaged - dead. In the aftermath, they were one of the regiments harassing General Robert E. Lee’s retreating Confederate army as it hurried toward the Potomac River and the safety of Virginia. 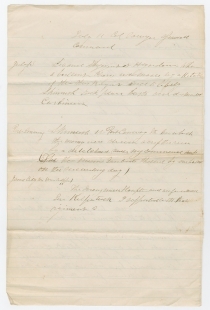 In the words of 1st Vermont diarist Horace Ide, “We sat right down before Lee’s Army, and they had to remove us before he could proceed.” Some of the regiment captured at Hagerstown were sent to Andersonville Prison in Georgia, where eventually 57 members of the 1st Vermont Cavalry died. Joseph D. Collea Jr., The First Vermont Cavalry in the Civil War: A History (Jefferson, NC: McFarland & Company, Inc., 1010), 187. 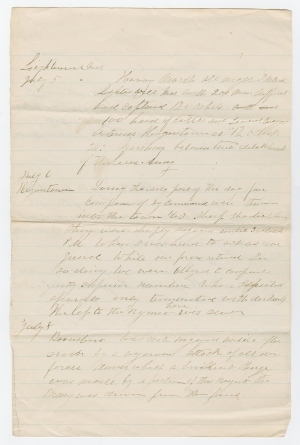 A report of the regiment’s actions from June 30 to July 8, authored by Preston, appeared in the Rutland Weekly Herald (VT), 6 August 1863, 3:1-2. Edward B. Sawyer (1828-1918), colonel of the 1st Vermont Cavalry from September 1862 to April 1864. Engaged in battles at Port Conway, Virginia, on August 25 and September 1, 1863. Engaged at James City, Virginia, on October 10, 1863, against Confederate cavalry under Wade Hampton.